The Vintage MG Parts 'Volumex 7 Fin' outlet manifold has been carefully designed with many beneficial features, the main one being to incorporate a low outlet pipe profile to avoid complicated cowl modifications. Many customers choose to make their own mounting systems, some of which utilise our support u-tubes. We have however, designed our own period looking mounting assembly for enthusiasts who are utilising F/J main front wing stays and this assembly makes use of the wing stay anchoring bolt hole positions thus avoiding drilling any extra holes in the chassis rails. We manufacture various components for blower installations, many of which are highlighted in the image below. We do not as yet manufacture the inlet manifold to the head although we will be tackling this one soon. We are the only manufacturer of the R Type blow-off valve (designed for all MMM cars). We have made provision for the optional fitting of an additional blow-off valve on the underside of the manifold. We can machine the blow-off valve platform for a small modest cost when both the manifold set and blow-off valve are being purchased simultaneously. A well thought out design has now produced a manifold with a wide range of benefits to the 1930s sports car enthusiast. This manifold has been designed to compliment our 'Volumex 7 Fin' and is also supplied fully polished finish. Scroll down to read more about the benefits of our manifold design. The 'Volumex 7 Fin' outlet manifold is the only manifold we are aware of which is designed specifically for use on C, J, P and L Types without the need to incorporate any modifications/welding to the manifold itself. It may also be suitable for the other models. The 90 degree elbow bend has a secondary benefit in that it provides a neat rectangular space between the rear fins and the mounting plate in which to position a period looking rectangular oil reservoir. The underside of the manifold incorporates a diamond boss for those wishing to install an inverted secondary blow-off valve close to the blower. We have these in stock. The inclined angle of the outlet pipe is set at 14 degrees to just nicely clear our blower crosstube support arrangement whilst leaving just enough room for the rubber hose connection. The main body of the manifold incorporates 7 thin cooling fins which are designed to compliment the 7 cooling fins on the Volumex supercharger case. 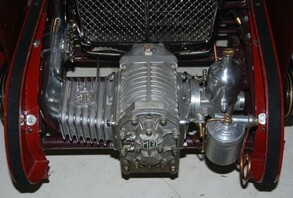 The top side of the main body section incorporates a period style MG logo. We have used the same logo pattern we used for the ENV manual gearbox case badge. It is therefore made to the MG factory size and layout. If there is demand, we may also produce this manifold without the MG logo for other makes of car using the Volumex supercharger. The 7 cooling fins have a 5/8 inch corner radius presenting a general period look. The manifold pattern is a split pattern mounted on mouldingboard in order to provide a casting with excellent finish quality. 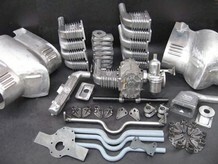 The castings are of LM6 and have a uniform wall thickness of 5 ½ mm making for a light casting for its size and although the outlet manifold is larger than the current Volumex manifold available elsewhere, our pair together are ¼ kg lighter and as mentioned previously, there is no need for modifications for the design to fit the car. The 'staggered' Volumex carburettor inlet manifold has also been designed with some careful thought. A centrally positioned carburettor flange can create problems with the positioning of the T4 float bowl and the position where the dashpot appears through the cowl. The Vintage MG Parts 'staggered' manifold moves the carburettor back by circa 1 1/8 inch which in turn radically reduces the need for untidy and complicated modifications to be made to the cowl itself and also gives a better degree of protection to a valuable carburettor. Supplied with a 3 ¾ inch diameter circular flange and bored to 1 5/8 inch diameter although customers can request a bore up to 2 inch if necessary. The carburettor mating flange is machined as a blank and ready for the customer to drill and tap to compliment their choice of carburettor. Thickness overall of this casting is slim at circa 1 3/8 inch in order to leave enough room to then fit an air filter to the carburettor intake. 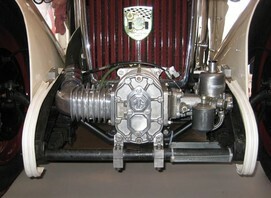 This manifold set is now being installed on various pre-war cars to include BMWs, Amilcar and Rally to name but a few.